After intense weeks of things being drilled through and various strangers coming in and out of the house every day, I could almost taste the silence when the work stopped. We’re not even half way through whole redecoration project, but we’re taking a short break. So, what have I learned so far? No house building, renovation programme ever reveals how unexpected problems can lead to delays and escalating costs. 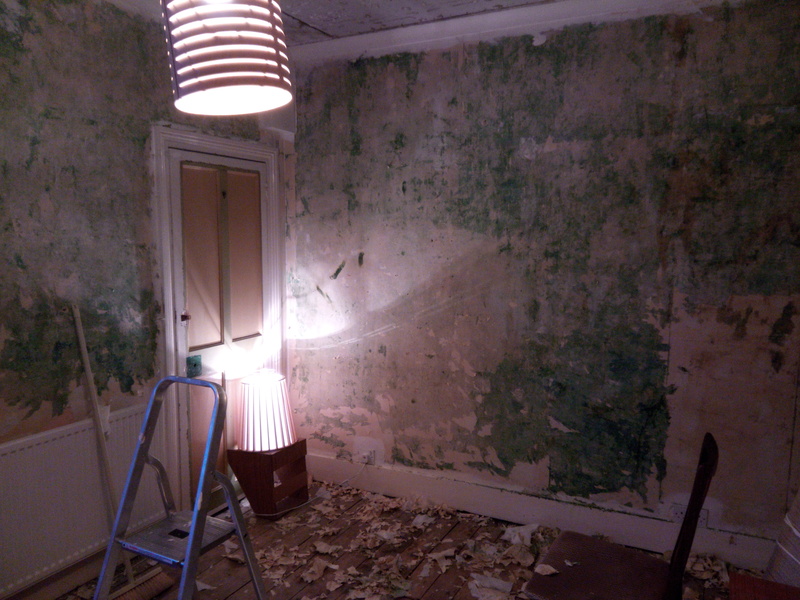 No tale about a house redecoration ever mentions “it was all going fine until we found the …”. So it’s perfectly reasonable to expect that everything should go smoothly and that there shouldn’t be any nasty surprises. Ha! Suddenly you will find yourself faced with, say, a door-frame that has been made narrower by a previous owner just wedging lots of pieces of wood into the frame and then putting kitchen cupboards over it to hide the mess. And when you have a stressed out plasterer subcontracted by the kitchen fitters telling you he doesn’t know what to do about it, that the plaster will crack if he plasters over it, that the door frame can’t be widened because of stuff that is too boring to go into now, then you will have to take charge and make a snap decision without knowing anything about plastering or carpentry or much DIY stuff in general. There were tons of situations like this. For each decision you take, there will be a myriad of smaller decisions to be made. You think you’re redoing a kitchen and that feels somewhat doable, but it’s not just redoing a kitchen, within that lurks a myriad of smaller jobs. The wiring is a world of its own, where do you want sockets, when should they be fitted, what faceplates should they have and so on. What about the door frames, what happens when the architraves (new word bingo!) are suddenly flush with the new plaster, should they be ripped out, if so what should the new architraves look like? Taps, door-handles, colour-choices, every decision contains thousands and thousands of tiny choices that all turn out to be vital to the final result. No pressure at all. My parents and my in-laws have done their fair share of renovating and re-decorating in their time. “There will be a lot of dust”, they said. Somehow it didn’t compute. We thought, “yes, of course there will be a lot of dust. We can live with that, things get dusty and then you just mop it up”. And then both Gerry and I seem to have suppressed this piece of information. 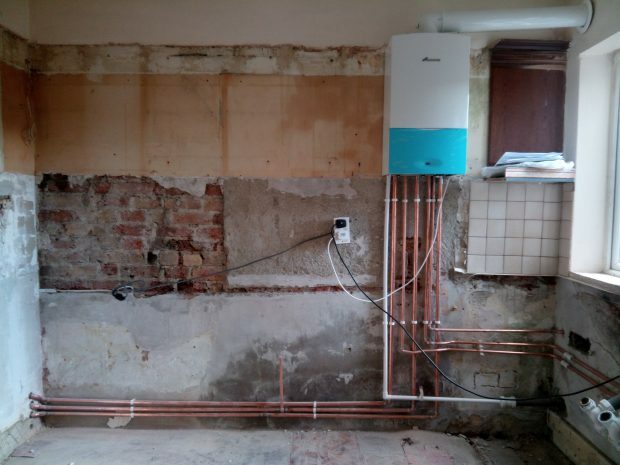 So when the very friendly boiler fitter arrived with a huge drill to install a new boiler in the kitchen we had just removed things from the one corner where he was going to work. He drilled the hole. There. Was. Dust. Everywhere. It was a dustocalypse, fine, particles that just went pooof up in the air and then hung around for days, slowly settling on every surface like someone had dumped bags of icing sugar through a hole in the roof, except this dust tasted like old cement. We coped with that. Then the kitchen was ripped out and the plaster was mixed and one of the kitchen fitters cut up the wooden worktops indoors. The dust is winning. When my phone charges at night a new fine layer of dust settle on the screen. There is no point fighting it anymore. It’s taken over. So remember this, when people tell you things are going to get dusty, just laugh and completely ignore it because then at least you don’t have to worry about it before it happens. Then you just have to learn how to live with the dust. Forever. Even though its stressful and we lived in total chaos for about a month when the kitchen was being redone (with the occasional night without electricity or hot water) I’ve enjoyed most of the journey so far. I’m learning new things, I’m challenging myself. We’re turning this old, loved but neglected house into a beautiful place to live that will work for us. The hardest part has been letting go of perfectionism. I’m the sort of person who thinks that I need to get everything right from the start. I’m trying to tell myself that I’m not a failure if I make a couple of mistakes, I’m just learning. 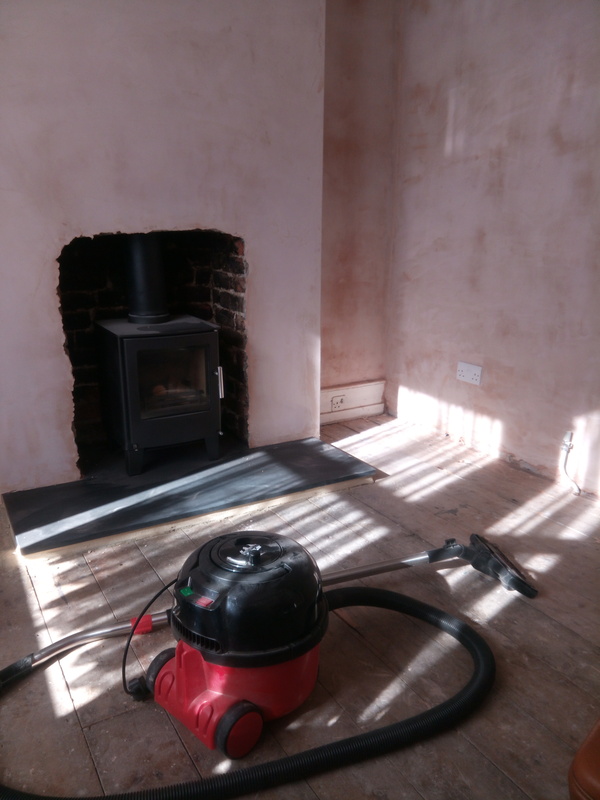 *I wrote this post in May, just after we had re-decorated the kitchen, but the whole experience was probably still a bit too raw since I didn’t post it then. We’ve moved forward at a snail’s pace during the summer. And that’s another lesson… sometimes it’s worth taking a time out, even if that means living with unpainted walls for a while. The electrician comes back this month to rewire upstairs and then it all starts again. Wish me luck!